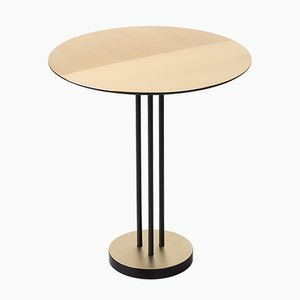 This satin and polished brass side table was designed by Venetian born designer Chiara Andreatti for Italian makers Mingardo, (est 2013.). Two available. Venetian born Industrial Designer Chiara Andreatti graduated from the Instituto Europeo di Design Milano in 2003 and completed the Masters program at Domus Design Institute. She has created objects for Thonet, Fendi Casa and Piero Lissoni as well as freelance work such as this table for Mingardo, who are a Venetian brand specialising in metal objects. The design was released at the Salone del Mobile Milan. Fabrication: Half polished and half satin matt brass circular top on a varnished iron with brass pedestal base. Design Inspiration: Neolithic fossilised geometrical motifs inspire Chiara. DC Stylist: Super weighty solid brass, unique and rare design piece. The glimmer of golden brass will add a hint of luxury to a bedroom or living space.